Making Sense of Brexit: Paul Mason on Britain’s Growing Economic & Political Crisis | Democracy Now! journalist and filmmaker. His recent opinion piece for The Guardian is called, “Corbyn delivered the Labour vote for remain—so let’s get behind him.” Mason’s new book is titled Postcapitalism: A Guide to Our Future. StoryJun 24, 2016Brexit Debate: What Does Shocking Vote in UK Mean For Fight Against Neoliberalism? AMY GOODMAN: Britain remains in a widening crisis days after voters chose to leave the European Union in their Brexit vote. British Prime Minister David Cameron has announced his resignation. Labour leader Jeremy Corbyn is facing a coup within his own party as more than a dozen members of his shadow cabinet have resigned or have been sacked. On Sunday, Hilary Benn was removed as the Labour Party shadow foreign secretary. HILARY BENN: He’s a good and decent man. ANDREW MARR: So was it hard for you? HILARY BENN: He’s a good and decent man, but he is not a leader. And that is the problem. AMY GOODMAN: Opposition leader Jeremy Corbyn has rejected calls to step down as opposition leader, saying now is the time for the party to stand up for its values. JEREMY CORBYN: Our policies on trade, economy and migration will have to change in light of the referendum vote. But that cannot be left to the likes of Johnson, Farage and Gove. Labour will fight to ensure that our agenda is at the heart of the negotiations over withdrawal from the European Union that lie ahead, including the freedom to shape our economy to work for all, maintain social and employment protections that benefit all, and that whoever leads the government is intensely held to account, to democratic account, throughout the whole process. AMY GOODMAN: Scotland has announced it will take any steps needed to stay inside the European Union, including possibly holding a second independence referendum. On Sunday, Scotland’s First Minister Nicola Sturgeon said the country will do whatever it takes to remain in the EU. Meanwhile, Northern Ireland’s deputy leader, Martin McGuinness, called Friday for a vote to unite the two sides of the Irish border. Global stock markets have plummeted. More than $2 trillion was wiped off global equity markets on Friday in the biggest daily loss ever. Earlier today, the British pound hit a 31-year low. Meanwhile, Secretary of State John Kerry is headed to Brussels and London to discuss the political and economic upheaval caused by the Brexit vote. To make sense of what’s happening, we go now to London, where we’re joined by longtime British economics journalist Paul Mason, who has worked at the BBC and Channel 4. His new book is titled Postcapitalism: A Guide to Our Future. So, talk about the fallout from the Brexit vote, Paul, and also why this vote to leave the European Union ever even took place. PAUL MASON: Well, the vote to leave the European Union took place because, repeatedly, 25 percent of British voters were, in fair elections—that is, the proportional representation system—were backing a party that wants to leave the European Union. And this impacted onto the Conservative Party, and it made it necessary for David Cameron to take a gamble of having a referendum to bury the issue for a generation, though he gambled and lost, because Cameron wanted to stay in the European Union. Fifty-two percent of British voters voted to leave. And as a result, Mr. Cameron, who’s signaled his resignation but is not yet gone, will go down in history as the Conservative leader who, first of all, destroyed the European Union—I mean, we have left the major bloc in the world economy—and he’s going to destroy the United Kingdom, as well, because, as you suggested in the introduction, Scotland will leave. Now, the overwhelming issue behind this vote was migration. And what we had was, basically, not just the kind of people who might support Glenn Beck and kind of Donald Trump arguing that migration had gone too far, but, as it turns out, many people who are organic and core supporters of the Labour Party. The free migration from East Europe and South Europe into the United Kingdom has brought about 3 million people over the last 10 years. And in many small communities, they feel—the people who are already here, including many black and Asian people, just said, “It’s too many.” And there’s no way of stopping it without leaving Europe. That was made very clear to them. This is what tipped the vote. AMY GOODMAN: —most young people voted for staying in the European Union? PAUL MASON: Sure. 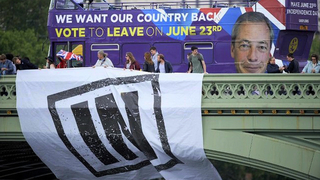 Seventy-four percent of young people who voted voted to stay in the European Union. The only problem is, we think somewhere between 35 and 45 percent of that age group actually voted—much, much lower than any other age group. The dislocation from politics meant that the people for whom this is going to mean the most had the least say. Now, many of them on social media are really angry. They want a—there is great support among them—politically, unfortunately, quite naïve people—for the idea that Parliament can cancel it all or that we can have a petition that cancels it all. It’s not going to be canceled. It’s happened. Now, demographically, it’s—let me try and explain this to United States readers. If you—London and Scotland voted to remain. Northern Ireland, by a majority, voted to remain. What did all those places have in common? They had a narrative that explains why remaining in Europe, even despite one’s criticisms of it, was a good idea. The Scots had a left cultural nationalism. London is a buzzing multicultural city. But Northern Ireland, it was, by and large, the Catholic population which voted to stay in, because they see staying in Europe as a link to Southern Ireland, which they—you know, some of them would ultimately like to join. Who voted to leave was small towns. Small towns were the bedrock, small towns where the private sector provides mainly low-skill, low-wage jobs and where there’s not so much unemployment, but a high degree of sort of drabness and lack—you know, there’s no cinemas, there’s no stores other than the basic kind of low-rent stores. And small-town Britain just attributed this—basically, the victimhood of neoliberalism to, I think, the wrong—the wrong cause. They saw migration as the key thing that had changed in their lives in the last 10 years, and they said, because some evidence points to it at the low end of the economic scale, “Migration is hitting our wages. It’s causing stress to our public services. We can’t rent. There’s a big shortage of rent and accommodation.” And when people like me said the real issue here is capitalism, the real issue here is neoliberalism, they would say, “Well, OK, but stopping migration still makes it better.” And ultimately, we—the shock on the night was that some university towns, you know, some towns that are high public service employment, therefore quite high unionization, maybe 30 percent black or Asian in ethnic mix, and with a couple of universities, voted to leave—so, Nottingham, Newport in Wales, Sheffield, where I went to university. These are kind of places like Ann Arbor, Michigan, and they still voted to leave. AMY GOODMAN: What’s happening to Jeremy Corbyn right now? PAUL MASON: Right now, behind me in the Parliament, there is a revolt of his own MPs. I think he won’t be able to face that down. And what it will lead to is another leadership election. I think this is the last thing we need. I think it’s driven by—there’s quite a big middle-class hysteria since the vote. The people really are feeling, “My whole life was shaped around the European Union.” European Union is kind of the soul of the democratic and social justice story here in Britain. And many of those MPs have just lost their nerve. They say they don’t think Jeremy Corbyn can win the election. I think, for the right wing of the Labour Party, the neoliberal wing, their fear is he can win the election, because the Conservative government barely exists. There is actually no policy at the moment, behind me, from the Conservative government about what they’re going to do about negotiations with Europe, about what they’re going to do about the public finances. There is effectively no budget. There is effectively a chancellor who’s on borrowed time. He’s our finance minister. So Corbyn should be in a strong position, but his own party really want to cause civil war, so we’re going to have that. I think we’ll have an election in the autumn. If Corbyn survives this leadership challenge, we have a chance of having the first radical-left government in the developed world, you know, from a big country. And I’m sure, absolutely sure, that these challenges to Corbyn are being coordinated by the political representatives of big business and, you know, TTIP and free trade. You know, that’s who’s behind it. Who they put up to challenge him, we’ll find out by, say, in the next 24 hours. AMY GOODMAN: And can you talk about who could be the next prime minister? PAUL MASON: Well, this Conservative MP, former mayor of London, Boris Johnson became the figurehead of the leave campaign. He’s come out this morning with a very emollient position. So, the leave campaign was saying, “Let’s walk way from Europe and just sign a free trade deal and go global.” Today Johnson is saying, “Let’s not walk away from Europe.” He’s implied they have to sign a single-market deal with Europe that would keep them within most of the European Union’s regulations. So I think he’s looking like the favorite. And then, from the remaining—remain side, there is a female minister called Theresa May, who is our justice minister right now, and I think she’s going to be the one who puts up. But ultimately this is a shattered party. They just destroyed the thing that they exist—they’re called the Conservative and Unionist party, meaning they favor the United Kingdom remaining together. And as result of what they did, we will leave Europe, and Scotland will leave the U.K.
AMY GOODMAN: And talk about the effect on Northern Ireland and Ireland, what’s happening there, with Northern Ireland, like Scotland, saying no to Brexit. PAUL MASON: Well, Northern Ireland didn’t unanimously say no. The unionist community, the Protestant community, many of them said they wanted Brexit. And the main unionist party, the Democratic Unionist Party, which is the more hardline, sectarian Protestant party, really did campaign for leaving Europe. Now, why? Because the border—you know, you’ll know, your listeners and readers will know, that the—and viewers will know, that the border between Northern and Southern Ireland has been the subject of two civil wars, a 20-year-long civil unrest and guerrilla warfare. Now, the point is that, with the European Union, that border was being eroded. Economically, you could cross it. And, you know, people could travel without really having to go through checkpoints. And those kind of developed a kind of understanding that, you know, Northern Ireland and Southern Ireland, despite years of warfare, probably have a common, shared destiny. Now, for the Catholic population, or the anti-unionist population, many of them now want a referendum to reunite with Ireland. At the moment, there’s no party in Britain that’s going to—ruling party that’s going to deliver that. But it just has left, I mean, what we’ve been seeing over the weekend. And this is the interesting thing. Within the Protestant community, the kind of more—the kind of middle classes, they—every Protestant in Northern Ireland has the opportunity to apply for a Southern Irish passport. And amazingly, we’ve been seeing people who have spent their entire lives committed to maintaining Northern Ireland as a separate entity within that island applying for—applying for Southern Irish passports. In other words, we’re seeing an amazing kind of almost cultural shift among the Northern Irish population towards thinking about what their future is, once Britain, as it will, leaves the European Union. AMY GOODMAN: On Saturday, Greek Prime Minister Alexis Tsipras said he did not blame the British people for voting to leave the European Union, but rather he blamed EU leaders. PRIME MINISTER ALEXIS TSIPRAS: [translated] The chronic deficiencies of European leadership, the insistence on extremely unjust austerity policies and knee-jerk xenophobic reflexes and anti-immigration rhetoric have been feeding populism, chauvinism and nationalism for a long time. As much as the British people’s decision troubles and saddens us, we must consider it a completely respectable decision, one that confirms there is a crisis of identity in Europe, a strategic crisis. AMY GOODMAN: That’s Greek Prime Minister Alexis Tsipras. Paul Mason, your response? PAUL MASON: Well, I think he’s essentially right. What we should say, first of all, is that 52 percent people who voted to leave the EU, not all of them are racist and xenophobes. They had legitimate economic concerns, and many of them, like me, had severe criticisms of the European Union’s action over Greece. This drove both a kind of left- and a right-wing response to Europe, which I tried to stop. I thought it would be a bad idea to leave now, but most people, 52 percent of people, said they want to leave. Now, Tsipras is right that this is essentially a crisis of European neoliberalism. We have governments in the center of Europe—Germany, France, Italy—committed to austerity, even as their own economy goes down the tubes. The Lisbon Treaty, which is the founding treaty of the European Union, mandates that they have to do the opposite of what, say, Janet Yellen has done or what Democratic treasury secretaries under Obama did, which is expand the economy. In a crisis, they’re mandated to shrink the economy. This is killing the Europe—I mean, in other words, the European Union is killing the ideal of Europe. And Tsipras is right to worry about the right-wing backlash. But even more urgent now for us is that what this is going to do—I mean, look, the market’s response today, wiping $2 trillion off shares worldwide, is not about Britain. It’s about what happens to the European Union. If we now see wave after wave of demands for other referendums and other countries beginning to leave—Greece should be the last one to leave, actually, but others might. And at that point, this 500 million-strong economic bloc, which is supposed to function and be one of the keystones, the capstone even, of the global world economic system, is disintegrating. And only that European Union stands behind the banking system. If the European Union breaks up into separate nations, then each of them will have to stand behind their own banking system, and their own banking system is already half-collapsed. That’s what is frightening the markets.